We offer aftermarket Amada replacement parts at a lower cost than anywhere else. Our replacement saw blade guides are some of the most renowned and reliable parts on the market. If you are looking for Amada saw blade guides, look no further! Amada saws or amada blade guides can be found here. 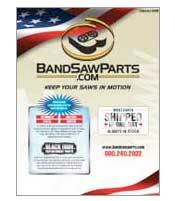 We have bandsaw guides, blade guides, carbide saw guides and probably any other part you are searching for your saw. Blade Guide L.H. 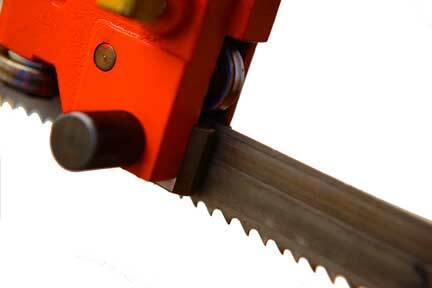 Insert HA-400* This guide is for the following Band Saw Machine- Amada HA400 Saws using 1.5" Sawblade. This guide is a Steel Backing with Carbide. To order a complete set of Guides you need one of each original equipment part numbers 1231728, 1231729, 1231730, 1231731. Set of 8 roller guides that are in addition to Amada part numbers: P Amada 604243, P Amada 604244, P Amada 604242 and P Amada 604254. These roller guides serve as "Back- Up Guides" for this Amada Saw Model.